Also, is it possible to have the "hide loot" until all the monsters are vanquished in the immediate vicinity optioned in the UI? Right now, it's disconcerting at times to have all the loot pop in and out if a new mob comes into the kill area. - Entering the mutation screen (on character page when hitting 'c'), causing the skill bar to dissappear. Workaround: reassign a skill to skill bar. - Extra waypoint portal thing spawns in starter town. - Losing a zone and leaving doesn't incur an exp penalty in HC. - Default setting is to 'not show items' for some reason on my character when logging in? Should it not save the users last preference? - Map reveal radius is too small. It doesn't even cover what you can see in the normal game view. - Mega-map shows red dots for enemies, yet the minimap doesn't while inside of towns. - Name in character screen stretches outside of the box once you get 3 subclasses. - The in-game window cannot support very many skills of a single given skill level (like several level 3 skills). They begin to overlap which makes it impossible to level/unlevel them in the UI. - Some rooms spawn bugged. Here is an image: https://i.imgur.com/dSCIiIu.jpg. I could not find the world save file for this area, sadly. But, this bug happened a couple of times during my level 100 run, so it should appear again eventually. When this bug happens, its possible to walk through walls on the map in many areas. Also, the corruption only partially effects an area. - Summon chaos lord lets you summon infinite monsters that match the area they are spawned in. - Teleport can mutate above max level to grant infinite teleports (I think? not sure how it works, but there ya go). - Ice Sentries are overpowered, (glacier as usual). - OLD: Please see my comments on drops and experience here: http://www.soldak.com/forums/showthread.php?t=37938 // Drop quantity and rarity of items is far too low, imho. I recommend rechecking the balance. - A true 'no-attack' left-mouse-button click, that doesn't require you to hold 'f' and lets you move and interact with stuff, but not attack. Last edited by Destro* : 09-23-2018 at 02:22 PM. This is an option already, I believe it is "Hide loot in combat". You'll want to turn that off. I'm definitely not a fan of the "Gladiator" scenario at all, or at least the current incarnation of it. It seems to frequently have odd issues but on top of that it doesn't seem to fit the game very well. Thanks for the fun game. I am enjoying it. The Necromancer and Pyromancer (or the fire based spell class) cannot use Wands. This skill is missing for both. Would you please add it? For the Beast Master, would you please add a reusable scroll so that a creature can be summoned at any time? The scroll, of course, will probably be more expensive. Would you please leave the terrain changes in? It appears that some people don't like them, but I think it adds depth to the game. Would you please add more NPC's that sell various things to the game? Would you please have them show up more often? If not already in the game, would you please add gamblers that sell various items? Sometimes, a skill cannot replace an attack icon the toolbar. It will put it next to it even if the skill icon is dragged over it. I also want a more lively town, or 1 i can build myself. I'm trying to make some kind of mod that adds vendors that are always there in town but can't seem to do it. Both of those specialties do have the wand skill, but each new character does have some randomness so some individual characters might not have it. Which specific skill(s) are getting replaced automatically with the attack skill? I'll need to check into this tonight or tomorrow night. 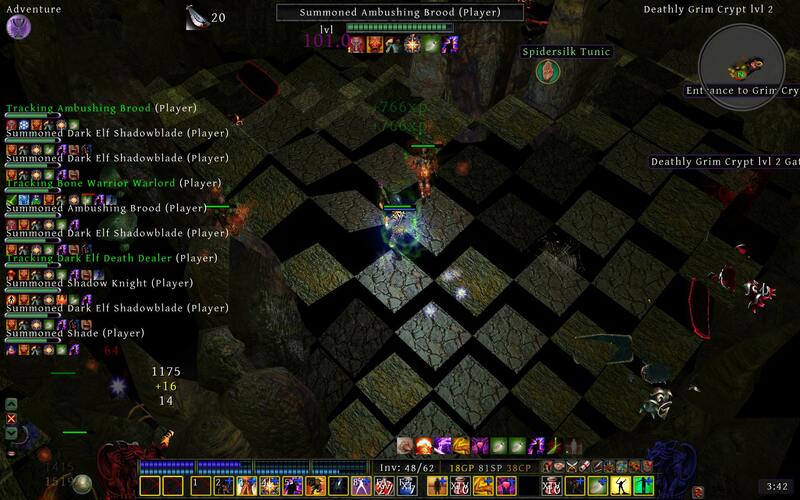 I just remembering dragging either the necromancer shadow bolt or the one next to it onto the attack icon and the gui moved the icon to slot 2 or 3 when I closed the skills screen. This may not be fully correct. Another thing I noticed is that entering the Mutation Screen to change your class and then cancelling out of it clears the toolbar. This is sort of annoying when in the midst of a lot of enemies. Not sure if a bug, but in the "Total War" scenario, your clan hearthstone can't be destroyed. Well, monsters that raid your clan won't destroy it anyway. Not sure what enemy clans would do if they actually raided. Yeah, your healthstone can't be destroyed in any scenario.